A lack of doctors means the country’s rating for healthcare has plunged. 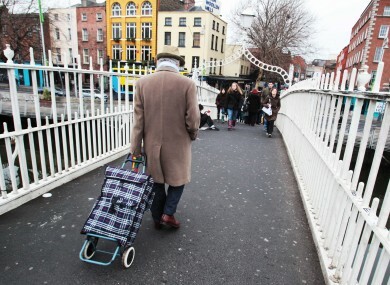 IRELAND IS RANKED as one of the worst countries in western Europe for retirement, according to a global benchmark. The annual Natixis Global Asset Management CoreData Global Retirement Index (GRI) had the country slipping eight spots down its list to 32nd in the world for retirees’ welfare. The ranking put Ireland on par with Uruguay and Poland – although this year’s scorewas an improvement on the Republic’s 2013 placing of 48th. Among western European countries, only the struggling economies of Spain, Portugal and Greece sunk to lower ratings this year. All three were ahead of Ireland in 2013. The list ranks countries according to four key factors that dictated welfare in retirement including: health and access to good health services, having material means to “live a comfortable life”, access to good financial services and living in a clean and safe environment. Ireland’s rating has fallen in all the segments, with the country plunging 14 places on the health index since 2013, when it was rated in the top 10 for the category. The drop in Ireland’s health category is mostly due to a smaller number of physicians, which is consistent with the country’s increasing unemployment rate,” the report said. It said all the top-rated countries shared several important characteristics, but the key contributor to retirement security was having “bold public policies” like compulsory health insurance and retirement-savings schemes. Tánaiste Joan Burton last week announced the government was putting together a “universal retirement savings group” to come up with a compulsory pension scheme for Ireland. Email “Ireland is one of the worst places in Europe to retire right now”. Feedback on “Ireland is one of the worst places in Europe to retire right now”.